Data collection is one of the major undertakings in any population and housing census. In Myanmar, this process was undertaken by over 110,000 people, from interviewers to supervisors. Immigration officials and community leaders from each township were also involved. They all had a specific role to play to ensure that the process of collecting the data was done in a correct and timely manner. An estimated 110,000 interviewers or enumerators were recruited for collecting data. They were mainly primary school teachers, recruited by the Ministry of Education and Township Census Committees. They visited nearly 98 per cent of the population in households and institutions (such as monasteries, hospitals, orphanages and military barracks) and other population settlements to gather information from the people of Myanmar. The interviewers compiled information for an estimated 11.5 million questionnaires. When counting households, each interviewer was assigned to visit 100 to 150 homes in a period of 12 days. They interviewed the heads of households and collected information about any person that spent the census night (29-30 March, 2014) at that household. “When I arrived at the station, I prepared for the day. I checked with the supervisor which houses I had to visit, counted the number of questionnaires I needed and started walking to reach every house,” explained Daw Aye Mar Win. She was one of the 100 interviewers in Mandalay hired for the pilot census in March and April 2013 to test the procedures for the 2014 Census. Around 20,000 secondary school teachers supervised the work of the interviewers. They were responsible for their field work, and checked the correctness, completeness, and consistency of the information collected through the questionnaires. They also reported on progress and collected the final questionnaires that were handed into the local immigration office. "I was happy and proud to participate in this process because I felt I was helping my country," said Khin Thida. She teaches geography in a small secondary school in Mandalay and worked as a supervisor during the pilot census. Everybody had a role to play in order to ensure the success of the 2014 Myanmar Census. For example, members of Parliament, political leaders, religious leaders, ethnic leaders, state/region administration officers, district administration officers, township officers, ward/village track leaders, community leaders, etc. helped create awareness of the importance of the census among the general population, communities, families and friends. Coordination of logistics at the field level was managed by immigration officials from the Department of Immigration and National Registration. They were in charge of receiving, dispatching, collecting and returning all the census documents and questionnaires from the field to the Department of Population at the Ministry of Labour, Immigration and Population, for data processing. "The census was a nationwide job and we had a special responsibility to our country. We needed support to meet international standards," explained Win Ye Tun, Deputy Director for the Mandalay region at the Ministry of Labour, Immigration and Population. 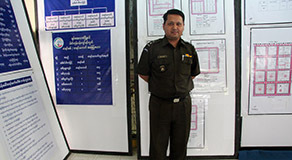 He supervised the implementation of the pilot census in his region.